...while the effect you describe may be difficult to describe and impossible to measure at this time, it may not always be that way. I don't believe that I said that I couldn't measure it. I can. The problem is describing the subconscious/threshold effect that I experienced. That was the part that I can't put into words. When I say threshold--I mean just that. Once it's attained, the analogy that comes to mind is like pushing catamaran or other light dinghy into planing: everything smooths out suddenly, and the controls become very sensitive to changes such as changing direction by wiggling the tiller or sheeting in or out a click or two to adjust the driving force: all the controls suddenly have "power steering". It can also be described like someone just released the parking brake while driving down the road. Once you decrease the phase growth and group delay to below a particular threshold, the effect suddenly appears and the satisfaction level in listening just goes through the roof. I'm talking 50% or more subjective improvement in listenability for a very small decrease in group delay/overall phase growth. It's not subtle--but difficult to describe. It's also a bit startling to experience, too. Very interesting thread. Troels Gravesen is reporting similar results on some designs with first order passive crossovers. Do you think phase correction of higher order crossovers, via FIR, would accomplish the same result? My money would be on the results being even better. I substituted a word previously... o O (explain) … and omitted the 2nd half, which further touched on my belief, for which I still am unable to post... (to eliminate off topic rhetoric) ... so I just wanted to convey this form of non-scientific explanation... explain = conceive... as in form or devise a plan or idea, but essentially born, as in invented in the sense to "explain" the unknown, but the unlikeliness is not the unusual, but where sounds evolved...so... God ---> Nature ----> Love. I think I may need to read Toole's book to fully grasp what you're saying, since some of the terms used in your posts in this thread are either not fully familiar to me, or not fully understood by me, or completely unfamiliar. This is not my field of expertise at all, but it does seem intriguing, and learning about some of these concepts could enrich my appreciation of music and how our equipment reproduces it. Thanks for sharing your knowledge and experience here. All I'm really talking about is the time-based behavior of loudspeakers/rooms and how well they respond to impulse input signal--all the way from the source of sound in the loudspeakers, to your ears. It turns out that humans can directly hear group delay distortion (above a certain threshold--with a different threshold value at different frequencies), but only if nearby early reflections in the room don't significantly interfere with the direct-arrival acoustic energy from the loudspeakers. A way to reduce or increase the phase distortion and its linked group delay distortion of the loudspeaker. This is pretty easy to do using a DSP crossover, but almost impossible using a passive crossover network, unless you're substituting complete crossover networks out in A-B fashion. Most people haven't gone to the trouble to do all three areas simultaneously (and effectively). Until you do all three, you probably won't hear the effect that I've been talking about. The "full-range" loudspeaker crowd, planar dipole loudspeaker crowd, and headphone crowd are usually chasing this effect using loudspeakers having many limitations in their output capabilities. I've found that there are too many compromises using any of these alternative loudspeaker types to be viable for my home hi-fi listening use. YMMV. Yes, if both the phase and group delay is basically flat through the crossover interference bands. I forgot to add: ...assuming that the pre-rise on the step response is also held to a very small value (also referred to as "pre-ringing"). Thanks for the content and plots you posted in this thread. Regarding the pre-rise of the step response seen with FIR filters usage, what is your obsevation? Do you have some best practices tips for obtaining a small pre-rise? Number of taps maybe (more or less ?, if the hardware can take it), windowing? 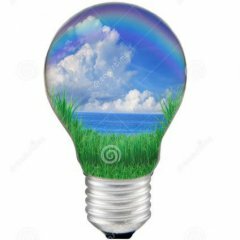 I do my filters with rePhase and clearly hear that using FIR filters the sound is not so 'clean'/'crisp' than using simple IIR filters in EqualizerAPO engine. 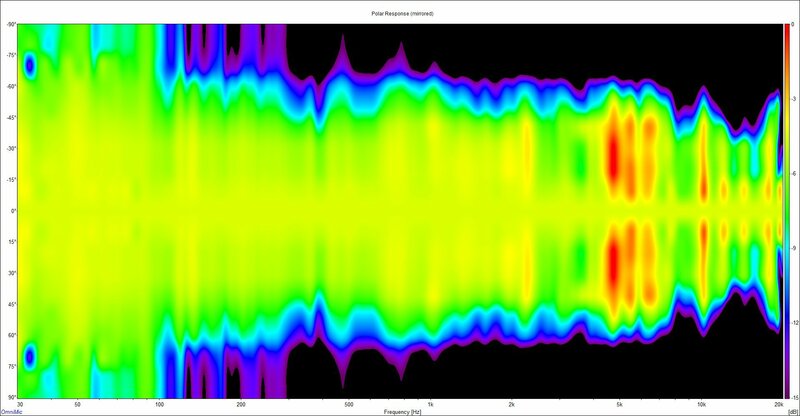 But then again, the phase is more liniar using liner-phase FIR filters. My observations come from IIR filtering using HF channel delay to reduce overall phase growth a little vs. first order...not FIR filtering. 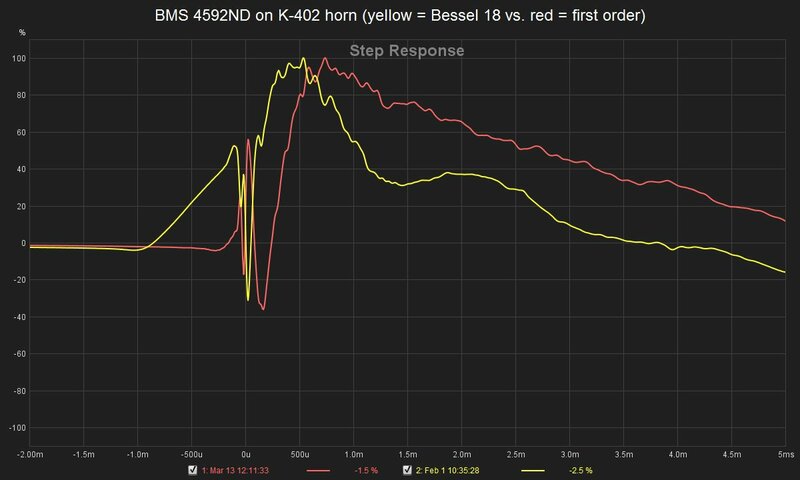 In A-B testing that I did recently, I could hear more harshness/hardness of sound of a "squashed" step response third-order Bessel vs. a conventionally set up first order that minimizes pre-rise (but lengthens phase growth a bit). Some of this subjective difference could be from confounded sources, and I can't really help you with the sound of FIR filtering, per se, but I can help a bit with the implication that ~1 ms step response pre-rise is probably audible. Thanks Chris for the explanation, I thought you were referring to FIR pre-rise time. I am about to start fabricating a K402 clone. Thinking about what CD to buy, so this next question is: Did you try also 1st order crossover with normal 2" CD or just with the coaxial BMS that you use? I haven't used first order crossover filters with anything other than the TAD TD-4002s on the Jubilees and the BMS 4592ND on the MEH. The only consideration is where to put the crossover frequency in order to control the extreme low frequencies being audibly reproduced by the compression driver below ~350-400 Hz. 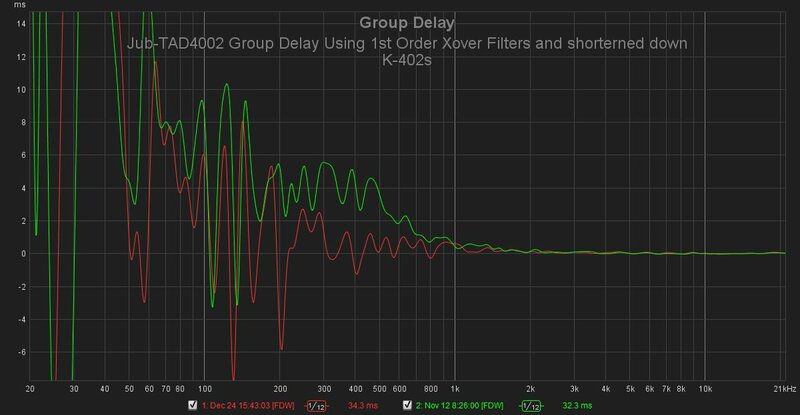 For the BMS 4592ND relative to other metal dome-type compression drivers, the crossover frequency can be lowered by 100 Hz since it is capable of being crossed at 300 Hz--according to the literature that BMS produces (and that seems to be true in listening tests). I believe that my Jubilee crossover frequency is at 550 Hz, but the shallower slope increases the width of the polars at the crossover band and actually helps to broaden the inherently narrow polars of the Jubilee in the 300-600 Hz band due to the truncated dual-mouth bass bin "dual slit" effect by using the controlled directivity of the BMS-4592NDs on the K-402 horn to fill the lower midrange polars. This improves lower midrange and upper mid-bass sound substantially, I've found. The phase of the lower bandwidth of the TADs relative to the bass bin woofers seems to support this broad handover (interference) band quite nicely. If there is an issue with the first-order shallow slopes and with a local rise in driver response in the stop band, I just add an extra PEQ to attenuate any driver stop band peaks. This seems to work quite well without introducing phase shifts typical of crossover filters. It's the flatter overall phase response that we're getting using the 1st order filters, and adding an attenuating PEQ doesn't divert the overall phase like minimum phase crossover filters do. Very interesting. It helps to explain why I have always liked first order filters, along with Dr. Bruce Edgar.